Whenever I had an academic question as a kid, my dad - who was born in Greece - would always start his answer with something straight out of the film 'My Big Fat Greek Wedding'. Me: "Dad, what does 'eucalyptus' mean?" Dad: "Well son, the word 'eucalyptus' comes from the Greek 'eukalyptikos', which means 'well-covered'. It's also the name of the Greek goddess of lamb fertility, whose icon adorns the church at Avrigopoulos near Thermopylae. Interestingly enough......."
Me: "Oh brother, here we go again"
The definition of the term 'monopoly' is much easier. 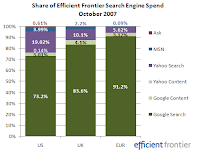 Look at the above graph from Efficient Frontier's blog, which shows share of paid search wallet in the U.S., UK and Europe. Thanks to EF Research for putting this out! YSM Blocked Domains: Hercules and the Hydra? Facebook Advertising: Get With It?